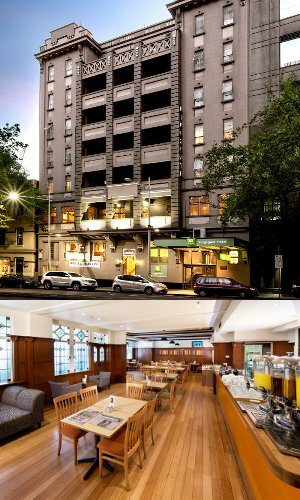 The Kingsgate hotel Melbourne is perfectly situated right in the heart of the Melbourne CBD and offers budget accommodation which is ideal for couples, holiday makers, international tourists and budget conscious business travellers. The Kingsgate Hotel Melbourne is conveniently located only 25kms from the Melbourne Airport and close to Melbourne's Crown Casino, Southbank, Etihad Stadium, Melbourne Aquarium, Rialto Observation Deck, Southern Cross Railway Station, the beautiful Yarra River and is only a 2 minute walk to an abundance of shops and restaurants. The discount accommodation in this Melbourne CBD hotel comprises of a selection of rooms with all of which include a range of facilities to ensure a very pleasant stay. The Ibis Styles Kingsgate's standard hotel rooms all offer ensuite bathrooms, comfortable bedding and reverse cycle air-conditioning, whilst the Superior rooms have been fully refurbished and have a lot more space for you to enjoy. Whilst you are staying at the Kingsgate hotel Melbourne you can relax in the cosmopolitan atmosphere of the property's licensed bar or make the most of the famous Bergerac restaurant which serves a delicious array of traditional French cuisine. The Ibis Styles Kingsgate Hotel truly is the perfect place to stay for people who want to be in the middle of the city centre but don't want to spend a fortune. Family Hotel Room - This spacious family hotel room has a double & 2 single beds. It also features a private ensuite, air-conditioning, heating, ironing facilities, TV, telephone and tea & coffee making facilities. Double Hotel Room - This queen hotel room is ideally situated in the heart of the Melbourne CBD. It features air-conditioning, private ensuite bathroom, heating, colour TV, radio, phone, refrigerator, ironing facilities and tea & coffee making facilities. Twin Hotel Room - This hotel room is just a short walk to everything in the Melbourne CBD. Featuring air-conditioning, heating, private ensuite bathroom, tea & coffee making facilities, colour TV, radio, phone, refrigerator and ironing facilities. Superior Double Hotel Room - This brand new hotel room includes a comfortable Double size bed with white linen, air-conditioning, heating, private ensuite bathroom, working desk, ironing facilities, refrigerator, LCD Tv with cable TV, free wireless internet access and tea & coffee making facilities. Superior Queen & Sofa Room - This quality hotel room includes a comfortable Queen size bed with a double sofa bed as well, air-conditioning, heating, private ensuite bathroom, alarm clock, sitting area, TV, ironing facilities, refrigerator and tea & coffee making facilities. Economy Plus Hotel Room - This budget hotel room is perfect for cheap accommodation in the city centre and features air-conditioning, heating, alarm clock, private bathroom, phone, ironing facilities, refrigerator, TV and tea & coffee making facilities.